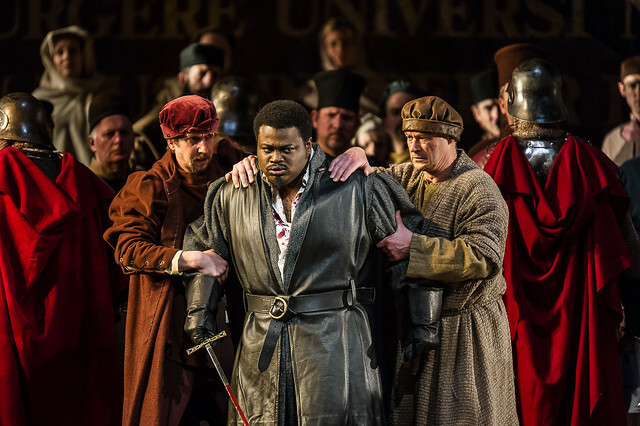 Simon Boccanegra runs from 27 June – 16 July. Tickets are still available. The production is staged with generous philanthropic support from Mrs Susan A Olde OBE, Afiya and Timur Kuanyshev and the Verdi Syndicate. Hotfooted in the footsteps of a magnificent DON Carlos an equally superb SIMONE Boccanegra! This was a glorious finish to the season and a wonderful tribute to the 200th birthday of the great man. Last night's performance proved what opera is about and I hope next productions will follow this example. I agree with Mr Erdos. What a pleasure to see a gorgeous production, set in the right place and period, that respects the text and the music and lets Verdi's work speak for itself without any agenda from the director. If only we could have this style of production for the forthcoming Vespri, rather than the Regie dross that is about to be served up to us. I really enjoyed the production last night. I was particularly impressed with Hampson, Furlnaletto and Platanias. Their singing and acting was of the highest standard. I thought Russell Thomas was terrific too, but, I know I'm being picky here, his sound spreads at the top of his voice, which is a shame. Careful Mr Thomas I want to see you still singing in twenty years time! I'm afraid I did not like Gerzmava - I thought her upper range, forced and slightly shrill (BTW - the decision for her to twirl around when she discovers Boccanegra is her father is cringeworthy - sorry but this is a Verdi drama not a Lionel Bart musical). The orchestra and conducting was refined and full-blooded - I smelt the sea. Bravi. An excellent evening on 10 July! An opportunity to enjoy great music making without an intrusive, not necessarily insightful, director's agenda. Surely this how it is meant to be - conductor, orchestra, singers and director working together to serve the work of a great composer. Verdi's message came over loud and clear. I thought most of the singers were on top form. Gerzmava was better later on. Not sure it's the right role for her. Russell Thomas was excellent - I hope he has a good mentor. I agree with a previous comment - please, no Strictly Come Dancing twirls during the recognition scene. Who's (tacky) idea was that? It told us nothing while Mr Hampson's reaction to being called "padre" told us all. Thank you. Is there any intention to revive this production in the future at the ROH? There aren't any plans as yet, but do keep an eye out for future Season announcements.